As mentioned in the previous post, Return to the Catskills Part II: Kaaterskill Falls, both the falls and the former site of the Catskill Mountain House were among the most memorable destinations we came across during our discovery of the Catskill Forest Preserve last summer. The sites are located very close to each other and can both be visited in one (action-packed) day. As you continue West on 23A after leaving Kaaterskill Falls you will soon see a sign on the right side of the road for North-South Lake. As you follow the road towards the entrance to the lake you will pass on your left the Twilight General Store in the village of Haines Falls. Not only is it a good place to shop for snacks or other picnic items to bring to the lake (where there are no concessions), but it is packed to the rafters with an eclectic variety of items—such as bake-your-own-bread in a can and snowshoes—that you probably won’t find at your local convenience store. It is very much worth stopping into. In any case, entrance into North-South Lake and the surrounding camp sites costs $8 per vehicle. Follow the sign towards North Lake. Once you arrive in the parking lot you’ll see a beach with a roped-off swimming area fronted by a bathhouse to your right—bathrooms are to the left. 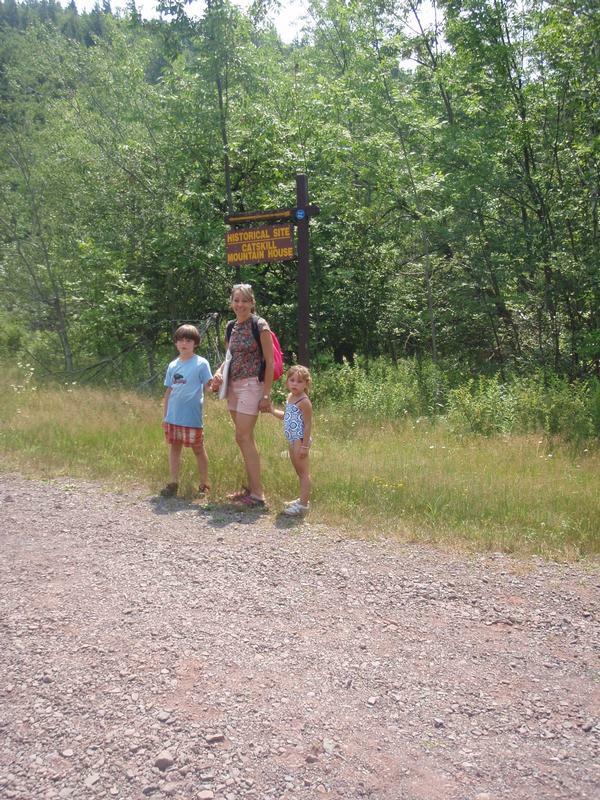 On our first visit we didn’t take advantage of the swimming option but this time around Halina and Riley, having just done the hike to Kaaterskill Falls, were very eager to jump in the lake. Nana Beth, having skipped the waterfall hike, was eager to do the relatively easier walk up to the site of Catskill Mountain House and Opi-Din, having done the other hike, was ready to relax on the beach. Thus we split into two groups and everybody was happy. 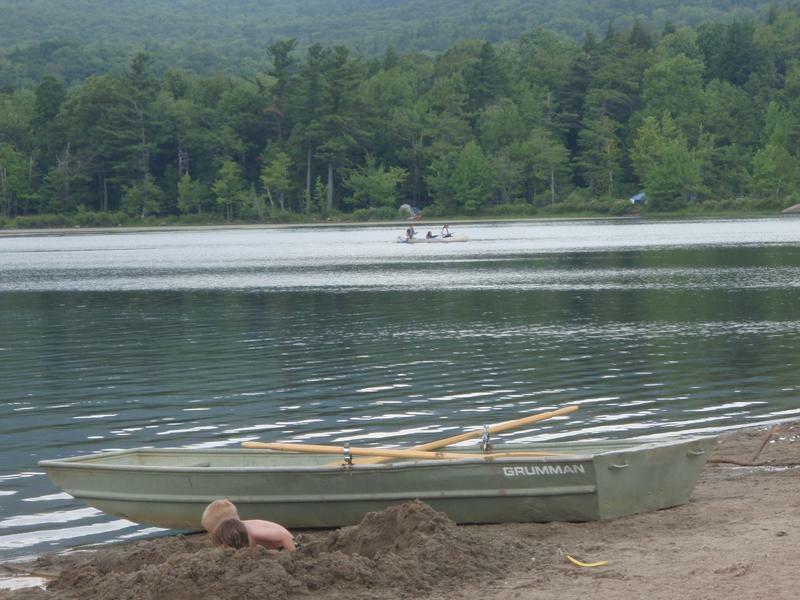 South Lake also has a beach and a boat launch where you can rent rowboats and canoes. A well-trod trail circles the lakes at the water’s edge, and there are vast campgrounds for tents and RVs throughout the park. 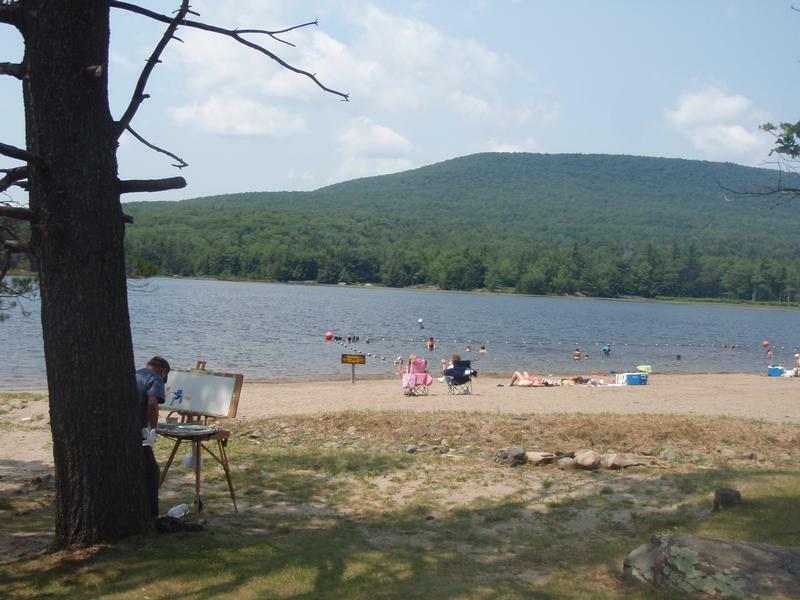 North-South Lake is the largest and most-visited campground in the Catskill Forest Preserve. The path to the Catskill Mountain House site begins at the far end of the parking lot. The quarter-mile walk is very easy and, after passing through the remains of what was once the entrance gate, you will arrive at a precipice from where—on a clear day—you can see three states. Two informational signs tell the history of the Mountain House and the luminaries who visited, including three U.S. presidents—Ulysses S. Grant, Chester Arthur and Theodore Roosevelt. The Catskill Mountain House hosted its last guests in 1941. Various efforts to revive the resort failed. By 1963 the abandoned site was in such a state of disrepair that the New York State Department of Conservation burned it to the ground and let nature take back the land. North-South Lake could be done as a day trip from New York City, but as recommended in previous posts, the Catskills are well worth more time and repeat visits. 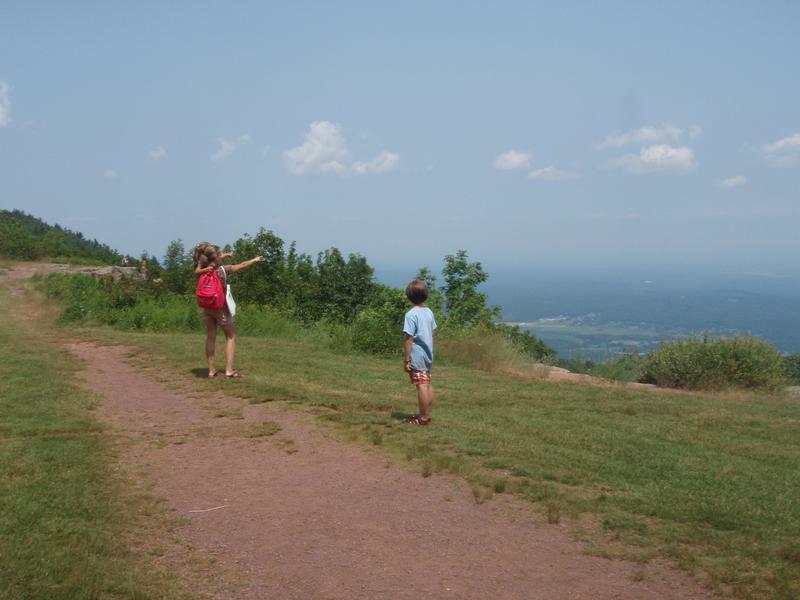 See the July 25, 2012, post for links to the official websites of Saugerties and Woodstock, both of which are helpful resources when choosing lodging options. Imagine stargazing or making s’mores with your kids, then getting up the next morning to paddle along streams and around ponds, pointing out painted turtles or an old beaver lodge. 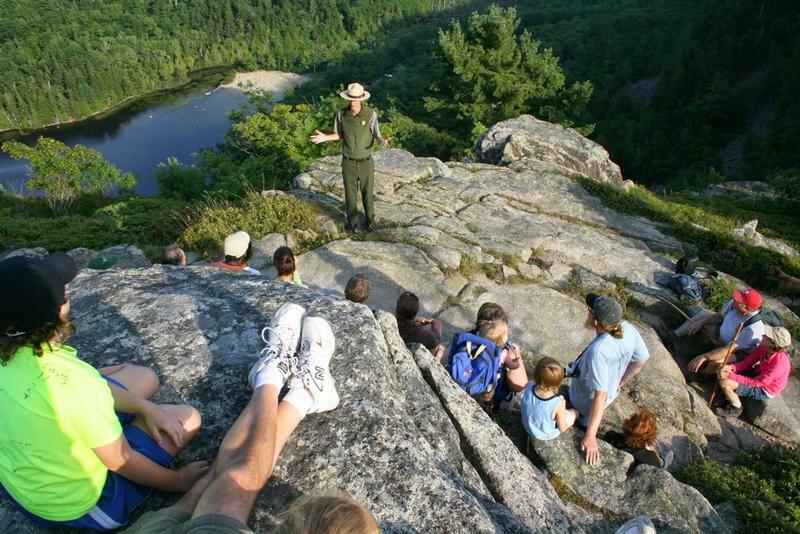 Such experiences are easy to organize at the following campgrounds, which offer paddling options on site.